Racing improves the 2012 Mustang Boss 302 and owners of this upcoming limited production car will benefit. If you've followed the other articles on the 2012 Ford Mustang Boss 302 and the Laguna Seca edition, you'll no doubt already know that extensive refinements and attention to details were made to ensure the new Boss Mustang was worthy of the name. But this time, the the old adage "race on Sunday, sell on Monday" really applies. Ford engineers used the wealth of on track testing on the Boss 302R as a tool to refine the new 2012 Boss. With 2 pole positions to it's credit the Boss 302R has been proving itself, a formidable competitor. Ford's little secret, however, has been that the 302R race cars carry many of the same components as the new 2012 Boss 302. Engineers decided that the best way to get real world data, was to use identical components for the planned road car and evaluate and improve them through racing. So when I said racing improves the 2012 Mustang Boss 302, I meant it. In fact, six months of racing telemetry were used in addition to the usual development tests, particularly for the Laguna Seca model, to refine the new car and make it a competitive race car right off the dealer floor. The very first Boss 302 engine off the line, went directly into the Boss 302R test mule for on track testing. The new 5.0 liter Boss production engine was already designed for racing, including stronger components such as forged pistons and stronger rods, so there was no need for a different racing combination. That also meant that the results on the race track would directly translate into real world information. Aerodynamic improvements were as a direct result of the track testing, which identified potential engine cooling and oil control issues. Also instrumental in the Boss 302R and development and testing of the new 2012 Mustang Boss engine, was the Canadian company, Multimatic, who was an integral design partner as well as on track tester, with it's own Motorsports division. Here's more information and videos on the Boss 302 Canadian connection. Also, from the track testing, changes in the radiator design and plumbing were made to take advantage of the additional airflow. And these changes have already made their way to the 2010 Boss 302 and the race oriented Boss 302 Laguna Seca. Ford Racing's brake cooling ducts made huge changes in the reduction of brake fade and have found their way into the Boss Laguna Seca. They'll also be made available from your local Ford Parts outlet. 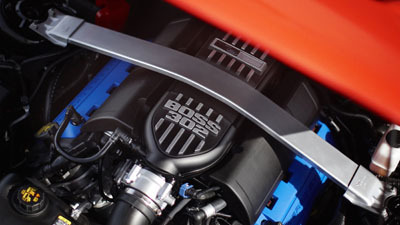 Time will tell just how well that racing improves the 2012 Mustang Boss 302, but it sure makes you anxious to find out!